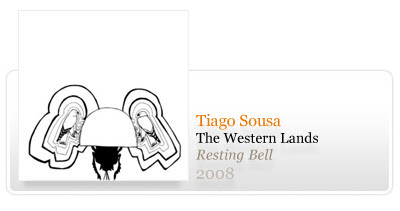 Released simultaneously as a cdr and a free mp3 release on netlabel Resting Bell, Tiago Sousa’s “The Western Lands” is certainly an intriguing listen. The title will be familiar to anyone with a passing knowledge of William S. Burroughs, and the liners tell us that Sousa’s music is “far more than an interpretation of Burrough’s text”. Titles aside, the inspiration and connection is clear, but not heavy handed. And while the results never quite yield the “musical cut ups” promised in the liners, there’s no disappointment here. What we have instead is a lovely 40 minute collection of restrained compositions drawing on modern classical, folk, noise (albeit very gently) and ambient touchstones. The basic elements, electric guitar, piano, nylon stringed classical guitar, and some floating distortion, are woven together with confidence and purpose. There are points (such as the distorted guitar and melodic piano of the first track) where seemingly disparate voices are placed together, vying for the listener’s focus and creating a nice tension. More often than not however, this tension is suggested and flirted with, rather than drawn out and made obvious. There’s something very restrained and subtle about Tiago’s work which lends it a serious character. Nothing stays too long, and one gets the sense Sousa has a strong interest in quality control and dedication to his aesthetic. As with the best music of this type, it carries itself with a sort of grace and maturity.